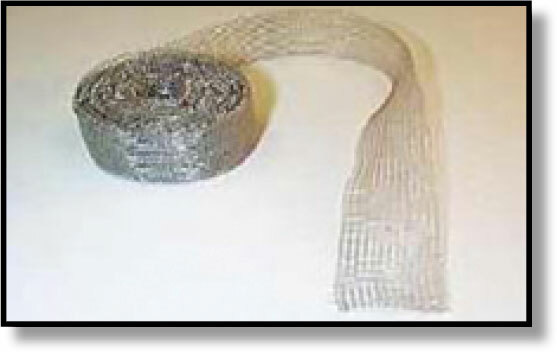 Leader Tech's TechMESH Tape has double layered strip of knitted wire mesh to provide effective EMI shielding and grounding for electric and electronic cable assemblies. This is particularly useful in applications where the need for EMI protection is determined after the cable assembly is complete and standard braided shielded cable cannot be used. The flexible structure of Leader TechMESH Tape permits it to conform to irregular surfaces and the cable contours during the wrapping process. TechMESH Tape is 0.020" (0,51mm) thick. It is available in tin plated copper clad steel (-71) or Monel (-72) width 10-12 openings per inch.